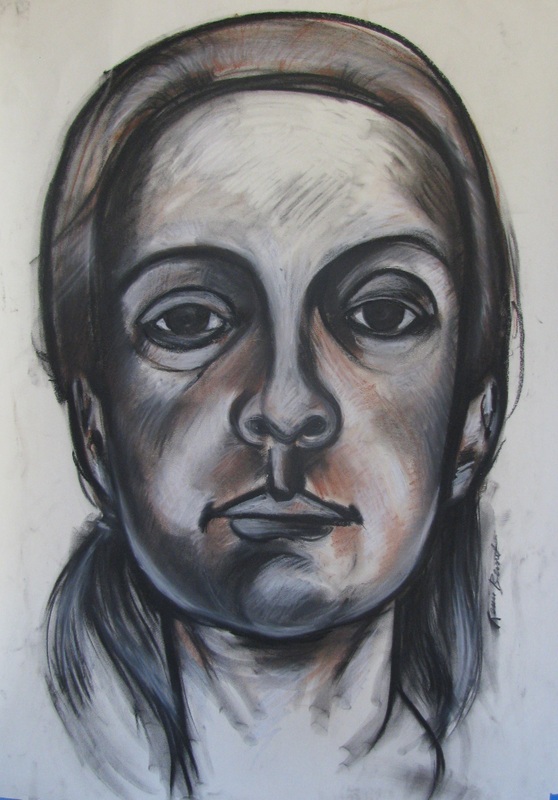 This charcoal/pastel drawing has been accepted into the Chico Art Center National All Media Show. This is a juried show. The piece is 24″ x 36″. When I was an art student, I earned the honor to study with the acclaimed artist and teacher Virginia Myers in the University of Iowa intaglio printmaking studio. I loved her classes and I worshipped the teacher. I worked hard but sometimes I was a little flakey. One day a student asked Virginia how do you know if you are really an artist? Virginia looked straight at her and said, “An artist can’t stop herself. She really has no choice about it.” What an answer! I was mortified. I was definitely not an artist by Virginia’s definition. Even though I wanted to be an artist more than anything and felt like an artist more than anything, I wasn’t exactly clamoring to be in the studio. To be honest I spent more time doing other things than making art. I took consciousness raising classes, chased boys and took up meditation. Then one day, after chastising myself for wasting yet another day, I finally understood what Virginia meant. What she really was talking about was obsession. It didn’t really matter whether I was making art or not, because if I wasn’t making art, I was torturing myself about not making art. I couldn’t stop myself. I didn’t have any choice about it. So my choice was this: to be an artist who worked or one who didn’t. Now that I am a working artist I look back on those days and think how what I was doing then was preparing me to be doing what I’m doing now. A real artist just is. Whether an artist makes something concrete or not you can always tell one by how they look at things. An artist doesn’t see things the way people of other pursuits see things. You’ll just have to trust me on this. We never get the opportunity to see how it feels to be in another person’s skin. But if you pay attention enough you will come to realize it is true. This acrylic is 16″ x 20″. I started it last year, set it aside and recently came back to it to finish it. At another blog I just read an interesting comment allegedly by you, and that comment had a link which brought me here. Well, not to this post, but to your site. I clicked the link as I thought I’d like to thank you at your own place. Was I surprised to find “Pastel & Carcoal” in the title? Not at all. Because: it is exactly like you phrased it (quote above). And, now I understand where your understanding comes from – the “other blog” was on a subject entirely unrelated to drawing. Hats are what a non-artist would see. You draw protection, personality, and privacy. Calm, as in absense of calm a hat would probably fall off the head. People wearing, and displaying, these intangible emotions. Resting in that comfort, being “at home” with themselves. That, is what your hats are. So, you draw that. 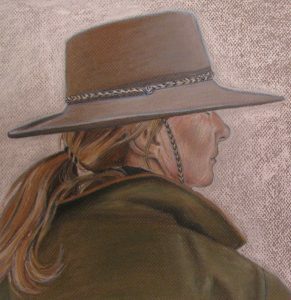 It so happens that your drawings resemble persons wearing hats, but the informed viewer will know (and the artist needs only to look) that there is more to it than that. 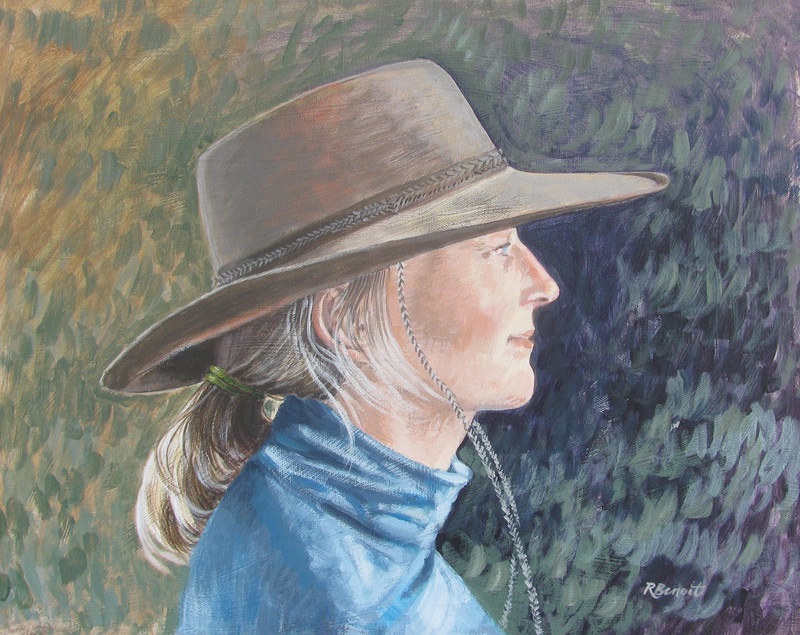 If your drawings were “only” of people with hats they would have no artistic value, a photograph could do that. But – and herein lies the art – you don’t just draw what you see (or, what everybody else can see), you draw what is – camouflaged by what you see. That it looks similar to something “we” (the audience) know is because you, personally, prefer the artwork to identify the subject, other artists could have done something else, eg non-figurative. I like that you write a lot, and not just technical information about the works. This inspires me – I may want to try that out. On my own blog I tend to post recent works with only a minimum of rather technical information. Forgive me for being anonymous, I’m not that important. I hope my words above were generous enough to compensate for this. Oh, and your comments on moving (another post) are spot on. Artists have to deal with all the intangible stuff; others just move. Thanks. Not that important, huh. I think you are important. Just for making a very cogent and insightful comment. Definitely generous, too! I would love to see your work. You’re welcome.